My brother Mike recently moved to Portland, Oregon. In his place, our friend Lauren has moved in. Besides providing a welcome chunk of the rent, Lauren brought her ibook, with wireless network card, which meant that she was going to share in the $49 monthly dsl bill from SBC. She unpacked a wireless router on Thursday evening and handed it to me to hook up. Immediately I unplugged our "wired" router and swapped in hers. It didn't work right out of the box, and I was in the middle of another project, so I unplugged and set it aside. Lauren would have to wait until tomorrow. When I came home for lunch the next day, she was sitting on her bed, and her ibook was open next to her. "Oh, sorry about not getting your wireless up and running, do you mind waiting until tonight for the internet hookup?" I said. She replied, "My internet is working". It took us about 3 seconds to figure it out: Someone else in the neighborhood must have a wireless hub, which Lauren had tapped into for free! Simultaneously, we shouted "You still have to pay! / I'm not paying!" The moral? 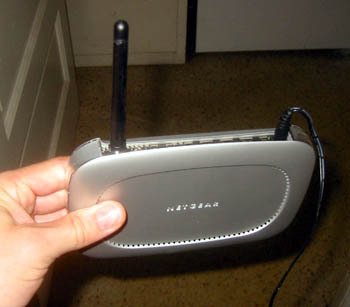 If your new roommate has an ibook with a wireless network card, tell them that your router is already wireless.